Trying to motivate young students to study biology can be a difficult task, but Fulbright alumnus Tom McFadden takes an innovative approach, incorporating videos, competitions, and even hip-hop music to help his students learn. Tom was very active while on his Fulbright to New Zealand in 2011 and 2012. He toured the country, promoting a competition called New Zealand’s Science Idol. 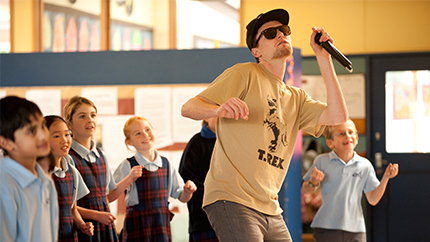 He performed at 22 schools, in Auckland, Wellington, Christchurch and Dunedin, and reached approximately 4,000 students. It was hard work, but Tom enjoyed every minute of the experience. Tom’s work did not stop once he returned home. He has since hosted a webinar for the State Department, entitled “Digital Storytelling”, a perfect way to share the knowledge he gained while on his Fulbright exchange. He has also started a new project to integrate art, history, science and music video production to teach students in low-income Bay Area schools in California. Called “Brahe’s Battles,” the students involved have reported an increasing interest in science, and improved communication of complex ideas. The videos have been featured on NPR, Scientific American, and Buzzfeed.